It was one of those spring mornings that start off cool, at only 10 degrees, but quickly warms up. After several recent visits along the Credit River it seemed like a good time to visit the mouth of the river. Port Credit is an unusual town in that it didn’t grow up around a mill or a cross-roads. 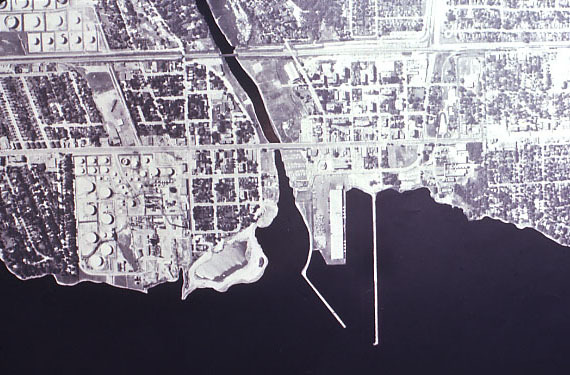 It was a planned community laid out by the government to support the harbour that was being built as a back-up to the harbour in York (Toronto). 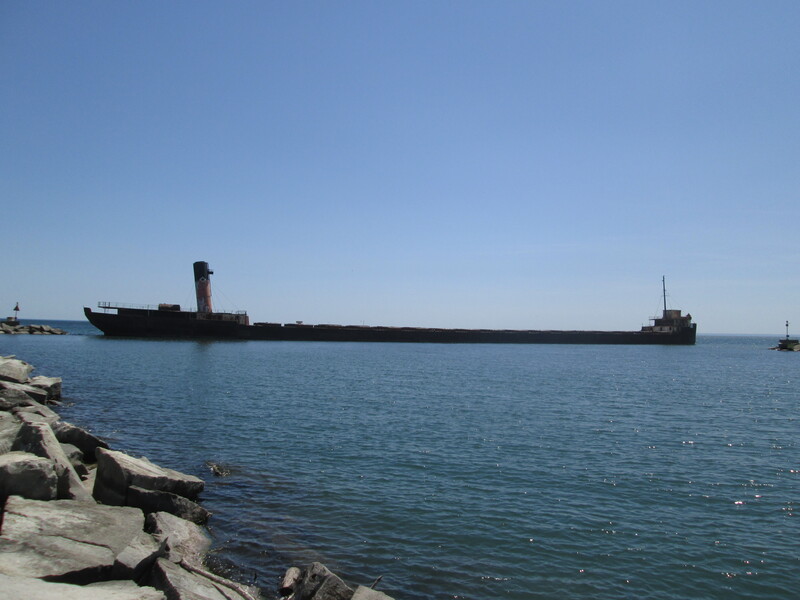 The Port Credit harbour is at the river mouth and is sheltered by a pair of break walls and The Ridgetown, a partially sunken bulk freighter which can be seen in the cover photo. The Ridgetown was also featured in the Adamson Estate on Cooksville Creek. There is plenty of free parking in town near the library. We crossed Lakeshore Road where the post office sits on the corner of Stavebank Road. 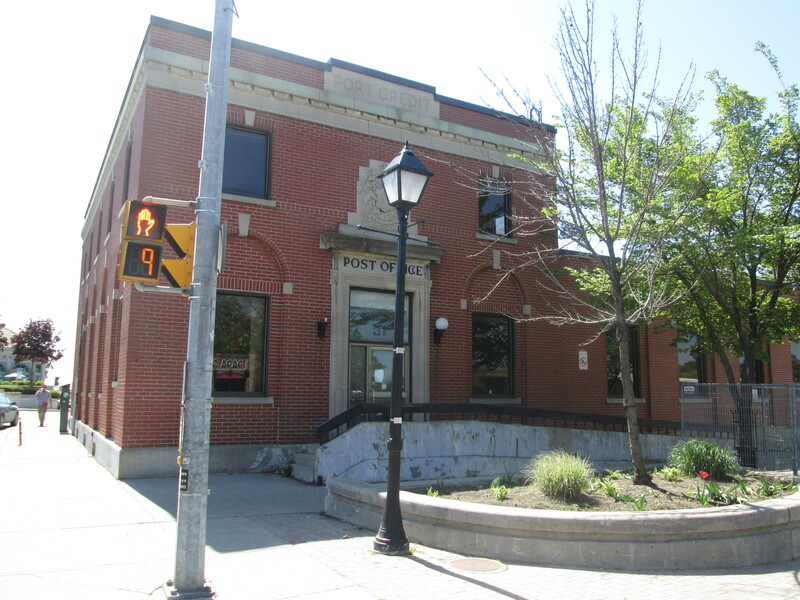 The Port Credit Post Office, Customs House and Armoury was built in 1931 as part of a “make-work” program during the Depression. The site had been reserved for government use since 1820 and when the decision was made to build a new public building in Port Credit it was ideally suited. The Department of Public Works had specific criteria which included “good drainage, easily accessible, in a commercial district, visually prominent, and on a corner lot”. Post Offices were also to be “fairly” close to the harbour or railway station. 31 Lakeshore Road East met all these criteria. The building is constructed in a style known as Edwardian Classical which was popular during the reign of Edward VII (1901 – 1910). Public works had suspended it’s building program at the start of WWII and picked it back up in 1927 with its existing building designs. This is how the Post Office building came to be 20 years out of date in its architecture. On the west bank of the river stands the lighthouse. 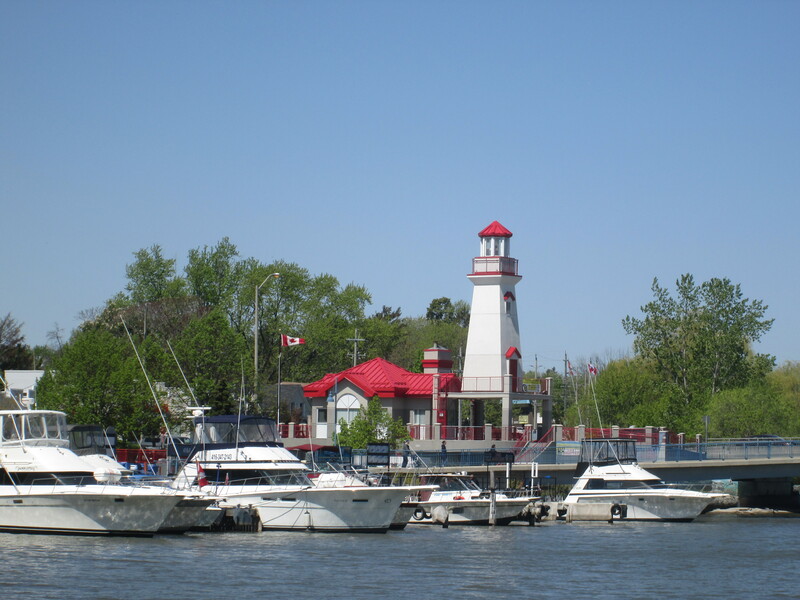 The first lighthouse in Port Credit was built in 1863 but it was separated from the mainland by a flood in 1908. By 1918 the lighthouse had closed and it stood vacant until it burned down in 1936. The present lighthouse was built in 1991 and is a replica of the earlier one. 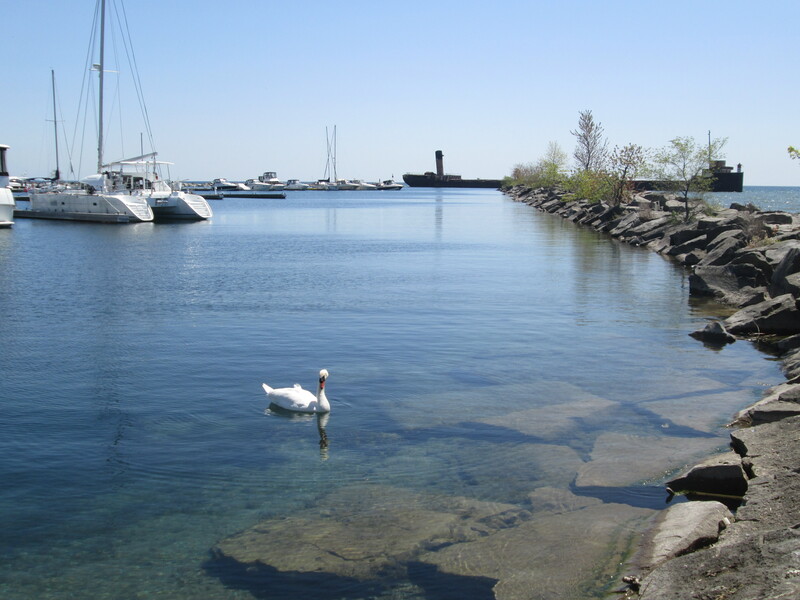 The Port Credit harbour has been active since 1834. Between 1880 and 1910 the harbour was home to an industry called stone-hooking. Large flat slabs of shale were raked up off of the bottom of the lake for use in the construction boom in Toronto. At its peak there were 23 ships registered as stone-hookers in Port Credit. Today the harbour is protected by two stone breakwalls as can be seen in the 1972 aerial photo below. The Credit River empties into Lake Ontario where it’s mouth is protected by an angled line of rock. Running straight out into the lake to the right of this is a second, longer, wall of rock. We chose to climb out to the end of each of them. In 1974 the ship The Ridgetown was added at 90 degrees to the end of the straight breakwall to shelter most of the open end of the marina. The first breakwall runs out from the eastern bank of the Credit River. The Ridgetown can be seen in the distance and one of many Mute Swans is watching us in the foreground. Built for $475,000 in 1905 as a flagship for the Pittsburgh Steamship Company the William E Corey was shipwrecked within 3 months. After $100,000 in repairs it was ready for service again. In July 1963 it was placed into British registry and renamed Ridgetown. Two years later it was sold to Upper Lakes Shipping Limited who operated it until 1969. Between 1970 and 1973 it served as a temporary breakwall for the construction of the Ontario Hydro Power Plant at Nanticoke. After this it was brought to Toronto where it spent the winter of 1973. 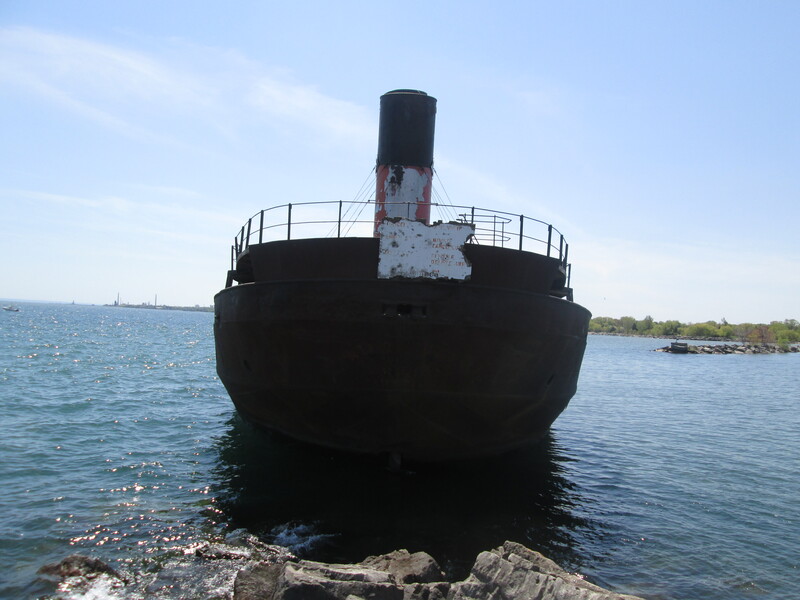 In June 1974 it was loaded with rocks and sunk to protect the mouth of the Port Credit Marina. 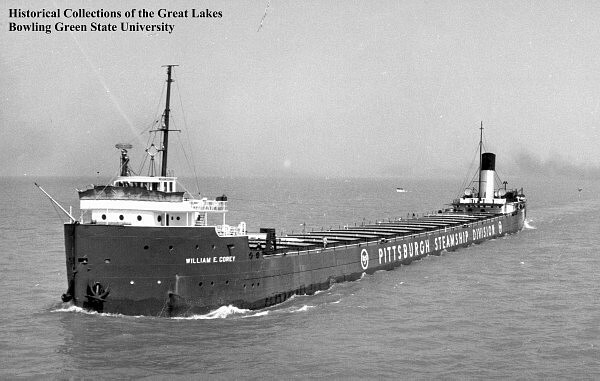 The picture below shows the ship when it was the William E Corey. As we made our way out the lengthy breakwater we got some great views of The Ridgetown. Finally, we reached the end of the breakwater and our goal of The Ridgetown. On the right of the ship can be seen the end of the first breakwater that we investigated. 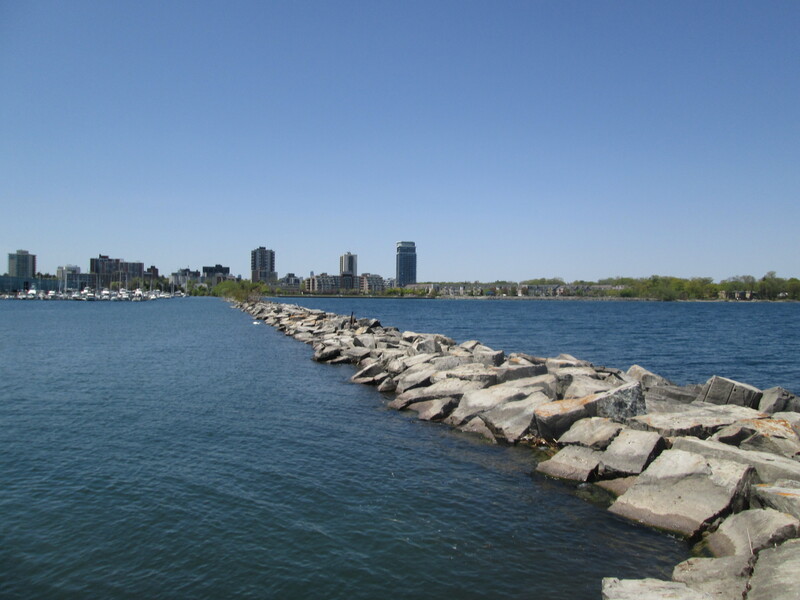 Looking back at the Port Credit shoreline gives you an idea of how long the breakwater is. The hike along this breakwater is challenging. The biggest danger comes from dozens of Canada Geese and Mute Swans that have taken to nesting along its length. They are prepared to defend their nests and several of them got into hissing at us. On the way back it started to feel like we were running the gauntlet. The Trumpeter Swan is the largest living bird that is native to North America. At 28 pounds the largest of the males are also the largest birds capable of flight. They can be distinguished from the more common Mute Swan by their black bill and feet. Of all the swans in the mouth of the river and along the two break walls this is the only one we noticed that was a Trumpeter Swan. It was also the only one which was tagged, in this case with a bright yellow “K94”. This is part of a project to reintroduce these swans which were near extinction. Port Credit has a cultural heritage designation and there is plenty more to be explored in the area. J. C. Saddington Park and the Imperial Oil Lands were explored on March 4, 2017 and can be found here. 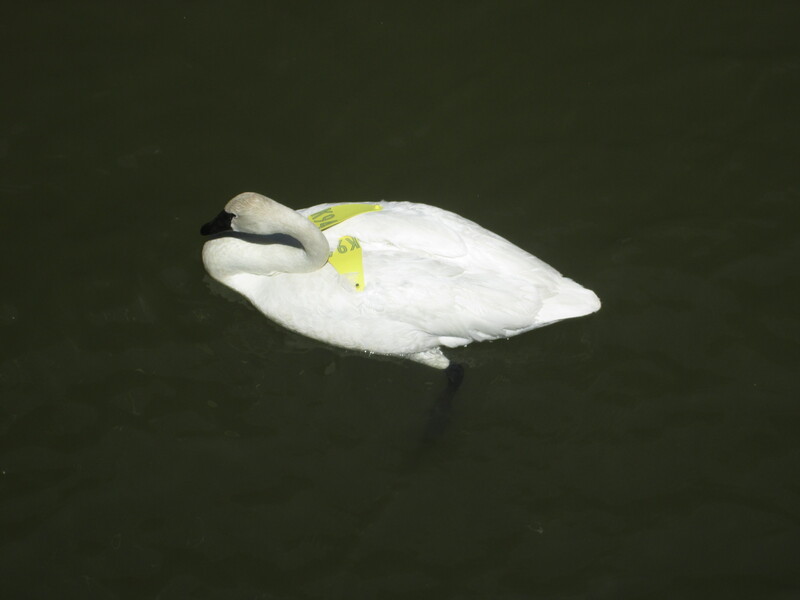 This entry was posted in Credit River and tagged Credit River, Port Credit Post Office, Ridgetown, Trumpeter Swan on May 25, 2015 by hikingthegta.